Even after the Cape Wickham lighthouse was built in 1861, the shipwrecks continued. Many ship’s captains mistook the Cape Wickham light for Cape Otway’s, causing them to sail straight onto the coast. 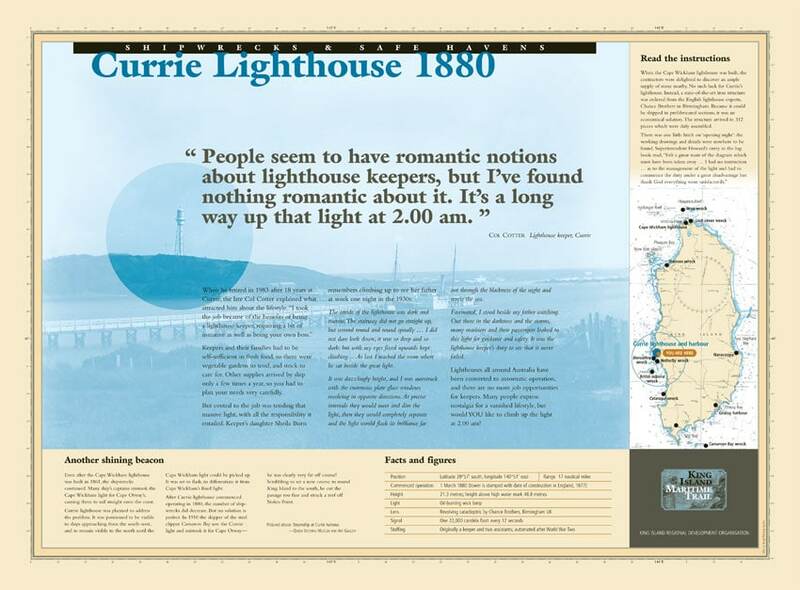 Currie lighthouse was planned to address the problem. It was positioned to be visible to ships approaching form the south-west, and to remain visible to the north until Cape Wickham light could be picked up. It was set to flash, to differentiate it from Cape Wickham’s fixed light. After Currie lighthouse commenced operating in 1810, the number of shipwrecks did decrease. But no solution is perfect. In 1910 the skipper of the steel clipper Carnarvon Bay saw the Currie light and mistook it for Cape Otway – he was clearly very far off course! Scrabbling to set a new course to round King Island to the south, he cut the passage too fine and struck a reef off Stokes Point.